I don't think it is a secret that I'm a bit of a Harry Potter fan. When I was on my way home from teaching candle magic at Treadwell's earlier this month I couldn't resist popping into the big Primark on the corner of Tottenham Court Road because it has a massive department selling Hogwarts-themed items. I bought the candle on the right. Primark currently has a range of various coloured/scented candles with the Harry Potter brand, which is pretty appropriate as Imbolc and Candlemas are coming up soon. Both of these festivals are often honoured by lighting candles to represent the first signs of spring returning and blessing candles for use throughout the year. 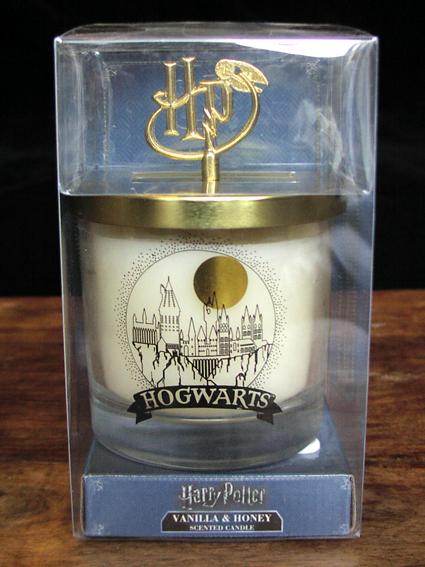 To be honest, I probably won't use my Harry Potter candle for any of my spiritual Imbolc devotions. There are two reasons for that. First, I already have a lovely ritual kit already. Second, I prefer to use unscented candles or ones that contain pure essential oils for my real magical work. Neverthless, this Harry Potter candle will still be a lovely thing to burn to cheer myself up on a cold dark evening. My own book Pagan Portals - Candle Magic contains a variety of candle spells and rituals you can do for Imbolc or at other times of the year. You can buy copies at Treadwell's or view the book at Amazon.